A new way to explore dioramas. Brief: Design an engaging experience for visitors of Carnegie Museum of Natural History (CMNH). Project Description: Wildlife Adventure is an experience filled with interactive activities to explore dioramas. By utilizing AR technology, and a mixture of digital and physical interfaces, Wildlife Adventure brings new life to the static dioramas and enables visitors to gain a new perspective on how human impacts affect the different ecosystems. How do we design a system for families to experience dioramas and learn about the human impact on ecosystem in a more engaging way? Wildlife Adventure is an experience filled with interactive activities that utilize augmented reality to allow visitors to discover new information about the dioramas and gain a new perspective on how human impacts affect the different ecosystems. Visitors first arrive at the center station. Here, they first select three animals on the screen to visit, then they collect gear and get basic instruction. 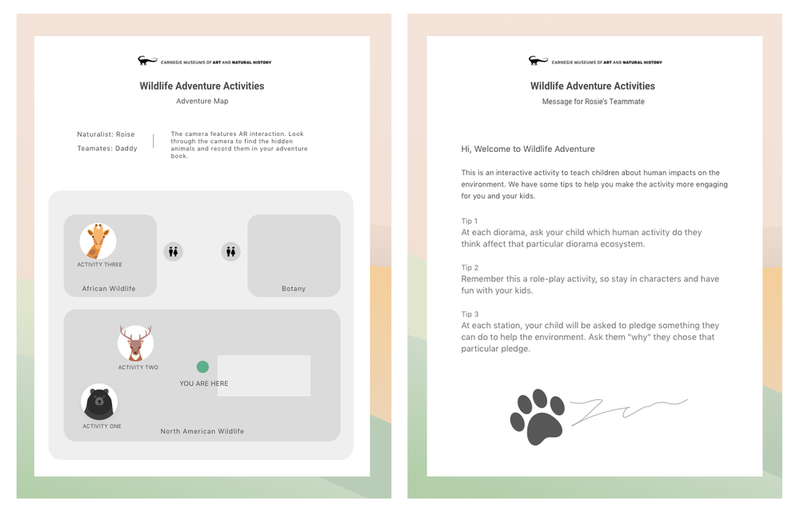 Visitors can customize their journey by selecting 3 animals they'd like to visit. Each animal lives in a different diorama, which has its unique interaction activity. Ranger Joe is the mascot of the adventure. He is present throughout the adventure to set the tone for the experience and provide audio instruction. Several items are given to visitors to encourage imaginary and role play, spark curiosity and foster great communication between children and their parents. The AR technology in the devices allow a user to find hidden animals within the diorama. The camera screen shows the user how many and which animals can be found. The hidden animals also reside in the ecosystem the diorama presented. The hidden animals a user found become the actors for the timeline based activity. The user is prompted to play with the timeline to see how an invasive species affects the ecosystem over time. Ranger Joe, the tiger mascot, provides additional audio information that prompts the user with questions to enhance observation of the changes. After seeing the animals disappear, the user is promoted to use the timeline to go back to 2027 on the timeline and guess which animal is the invasive species. The magnifying glass on the screen allows the user to view smaller animals in greater detail. The last part of the activity enables a user to watch a video about the invasive specie and read additional information. The user is then taken to a pledge page where they are promoted to select a way they will help the environment. A pledge system helps relate the human impact information we are introducing back to the user. For each activity, the pledges relate to the specific human impact that is introduced. 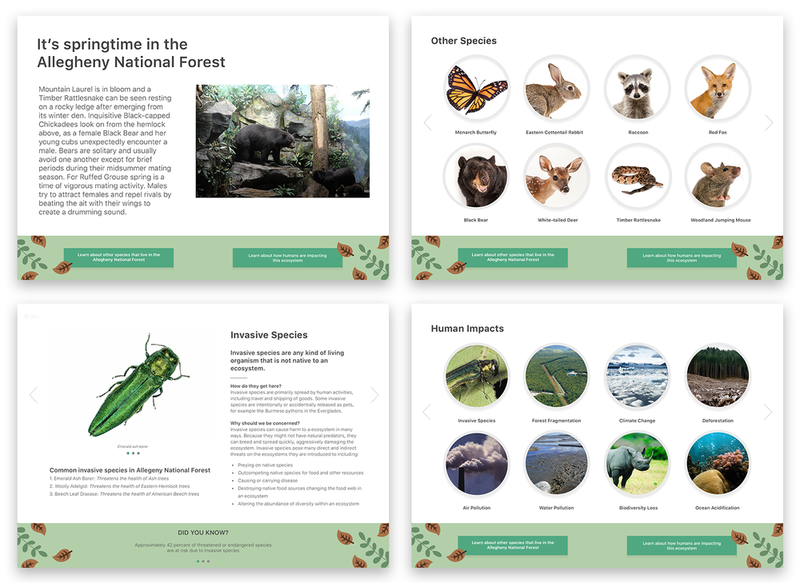 The initial state of an informational screen on the side of a diorama includes information about human impacts and additional species that reside in the ecosystems presented in each diorama. This would allow all visitors, including those who did not want to participate in the activities, to have access to the layers of information. 1. A lack of communication between families observing the dioramas. 2. A lack of engagement viewing the dioramas. 40% of families spent 2–5 minutes in the diorama hall, which contains 26 dioramas. Human activities are shaping ecosystems in all means, but the dioramas rarely show a sign of the human impacts. Visitors often regard the dioramas as old-fashioned and static––that once they saw a diorama, they didn’t have to revisit it because it always stayed the same. Our concept went through different phases in response to feedback from the museum staff. Use of technology allowed us to layer new information on top of dioramas without physically changing them. The progression of the technology integration and form of the physical artifact transformed based on feedback from the museum staff and how these elements integrated and enhanced the activity concepts we were exploring. Before - engage young children: at first, we wanted to target children ages 3-6 years. The visual style we chose had a playful manner. It used abstract forms and youthful color palette to appeal to young children. After - engage a wide range of audiences: later we transformed the visual style into an illustrative one that would be appealing to both children and adults. We also looked at the museums current style and incorporated elements from it. For future, we want to design another version of Wildlife Adventure that is more appropriate for adults. Several elements that would be different for adults can include: presenting more complex concepts through layering of information about how human activities affect the ecosystems, changing the language to be at a higher reading level.